Which of the chessboard appeals more to your eyes? The left? or the right? Let's talk about symmetry. And why it's important to have a symmetrical diamond. To the human eyes we see symmetry as beauty, it captures our eyes, makes things simply, more pleasant to look at. 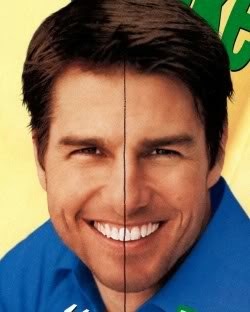 Take for example, scientists prove that symmetrical faces are what makes most men/women handsome or beautiful / appealing. But is that all to it? Just looking symmetrical? Maybe I like asymmetrical stuff? Nope, far more importantly, the symmetry of the diamond, because of it's facet alignment affects the light return of a diamond as well. 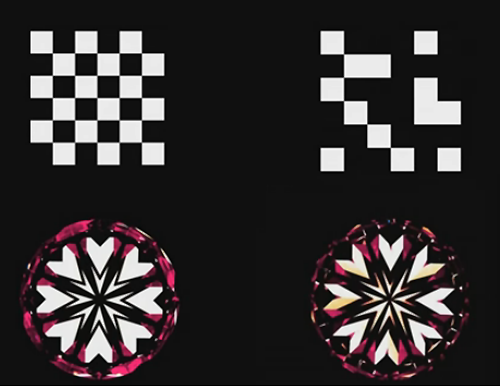 The above shows 2 AGS ideal 0 diamonds, triple 0's. The one on the right is what vendors these days still call hearts and arrows. It sure looks like hearts and arrows, to someone just starting out, and looking through a hearts and arrows loupe at the diamond on the right will find it symmetrical and fascinating. Note where i circles the major light leakage under the table of the diamond on the right. Dum dum dum! 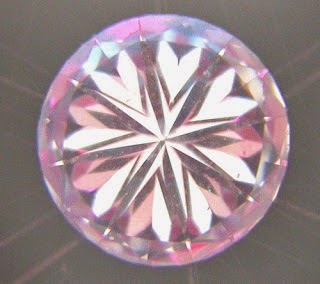 Yes, symmetry can affect the brilliance and light return of a diamond because of the way the facets are aligned. Why does this happen though? Cutters tend to cheat when polishing diamonds, sometimes to save or retain weight on the diamond. And what happens here? We have uneven polished facet surfaces. Which is all revealed in the hearts. A straight polished facet (perfect hearts) allows light to bounce off the facet evenly. 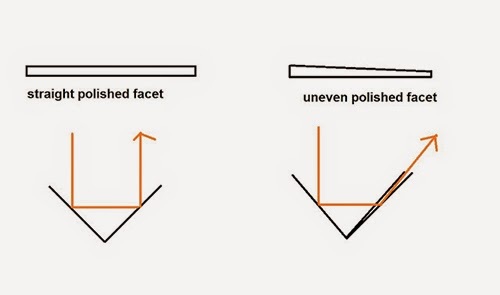 Uneven polished facets simply causes light to "slide" off which results in leakage of light. This also means, since light is simply sent in random directions, your diamond will not show a visually balanced firey diamond throughout, instead fire randomly produced, in a smaller effect as well. Under a white light, your diamond will suffer in brightness, contrast and symmetry patterning. I talked about what makes a JP diamond in the basic 4 C's except Cut. Which is the most important and most elaborate of all the other C's, for the simple reason that there is so many things about it that it may not be even possible to cover everything on a blog. This is pretty much a prerequisite. 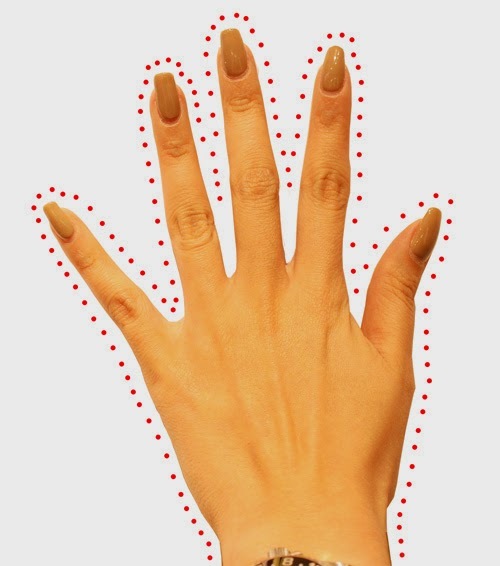 Let's first talk about what is an Ideal cut. I'd like to first say that there is no absolute definition. There should be, but there isn't. Why? Originally it should be defined as a proper set of proportions defined by Marcel Towlkowsky. 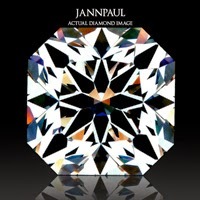 However, you will find tons and tons of jewelers internationally and locally that sell "ideal" diamonds that fall way out of this set of proportions and then they brand it, and they laser inscribe it on their certificate, and they define ideal that way. So at the end of the day, how can we define what is Ideal? The HCA / Hollow's Cut advisor is a great Tool to help you out with this. 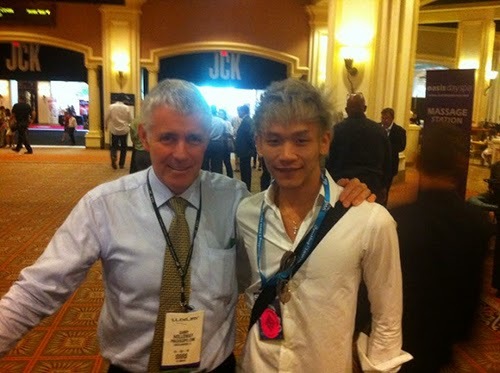 That's me and Mr Holloway at the Las Vegas convention, great man who developed this tool for free(also developed the idealscope)and for people to filter out the good diamonds from the bad. There are limitations in the HCA as well which is why its only a filtering tool, which I will cover later. In a nutshell, an ideal cut is a given set of proportions of a diamond that returns majority of light. So what is a Super Ideal? 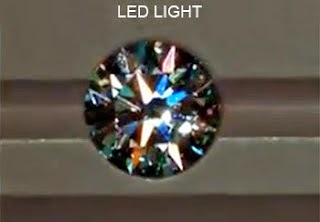 A Super set of proportions of a diamond that returns majority of light? Unfortunately the term Super Ideal is even more misused that the term ideal. Half the time jewelers will just use it for the sake of using it, even though they don't even know the definition to it. This is probably a poor example, but it's more or less the best I can cook up in my head at this point of time, the Toyota MRS is an ideal sports car. To drive fast, top down, 2 seater, more or less gets the job done. The Ferrari is the super sports car. Does everything a normal sports car can do, but does everything better and looks better. 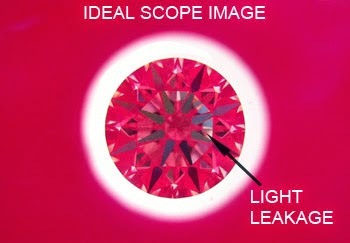 The ideal diamond gets the job done in returning light, however the super ideal diamond does everything better. The difference is, between a MRS and a Ferrari there is a huge price difference. However a Super Ideal vs an Ideal can sometimes cost the same, cheaper or slightly more expensive. - Tools must be used to prove these claims. No tools, no claim. In short, the super ideal diamond requires heavy scrutiny. Everything must be close to as perfect as possible. Each JP diamond had to possess the highest quality boundaries, in the world, period. What does this achieve? Customer satisfaction, as well as distinguishing JP from any other brand. Each ring a client possesses can proudly say they own one of the most beautiful diamonds in the world, each ring a client possesses is of the highest quality. This is the reason why we don't want to sell lower grade diamonds, sacrifice in anything to try to make extra cash. We have a reputation to upkeep! We never touch flat counts. like 0.30, 0.40, 0.50, 0.70 etc etc. Firstly, it's a bad investment for ourselves. Understanding how diamonds are priced in terms of it's carat size is a big advantage. Imagine this, if you happen to ever chip your diamond, and it falls in the 0.39 category(if your diamond was 0.40), you'd lose a significant amount of value to your diamond. But mainly, paying so much more for 0.40 is just a bad investment. In the American market, warm colors are pretty popular as people like to set it with yellow gold. In Asia however, white is THE diamond ring to go for. If you have ever placed a diamond D, E ,F ,G & H together in a row, You'd see the colors drop little by little, and when you reach the H, is where you realize the yellow tinge is something your eyes can't ignore. This sudden drop in color is the reason why we avoid it. 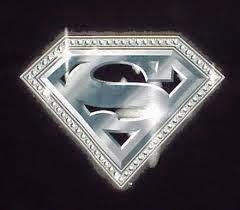 We want our clients to own a white diamond, not an off white, not quite white, not pretty white, we want it, white white ! Like I mentioned in the previous post, clarity is a big factor to my Dad, he's always focused so much on clarity because he's rather old fashioned. However, i agree to a certain point how important clarity is. By all means, we avoid SI1 and below because like the "H" color, it takes a sudden drop of being eye clean to not so eye clean anymore. Black carbon spots and cracks are obvious in this region, and the biggest factor in play here is: certain inclusions may cause your diamond to potentially chip or crack in the future. Who wants to buy a diamond that may potentially chip? Another factor is our filter on VS1 and VS2 diamond. Black spots and feathers/chips etc near the edge of the diamond are avoided. Sometimes we wonder how some diamonds make the vs2 or vs1 range when they rightfully should be placed under the SI range. These make poor purchases, and we avoid them. This is one of the best way i can illustrate this to you. Which do you think makes a better purchase? the left or the right? Both VS2 on GIA/AGS. This is why we filter our diamonds on clarity as well. The left diamond honestly is a recipe for disaster. You can argue that the black spots may be covered with a prong, but what about the feather at the bottom left? Cover it with a prong and the extra pressure may cause that crack to worsen. 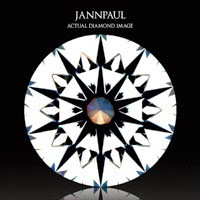 I'm going to talk about what makes a diamond a part of the JP collection, why we only choose to sell these kind of diamonds, and out of all the diamonds in the world, why these? Some of you may know, my father has been in the jewelry line for more than 40 years. I remember the days where he used to throw me a set of tweezers and diamonds in the size of 0.01 and tell me to find the inclusions on those diamonds. Not cool Dad! 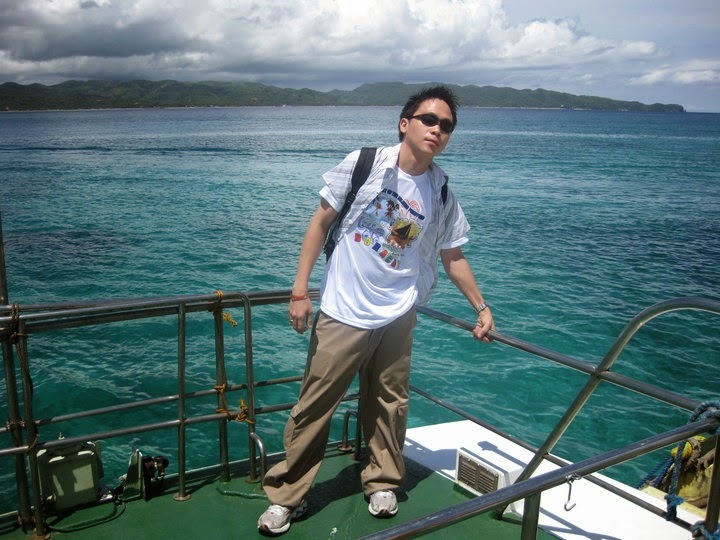 Anyway, it became more of a chore than enjoyment, I really did not understand the point of it. Black spots, white spots, clouds, cracks, chips etc. The fact they were not certified made it worse; I could not cheat and look for the plot inclusions. 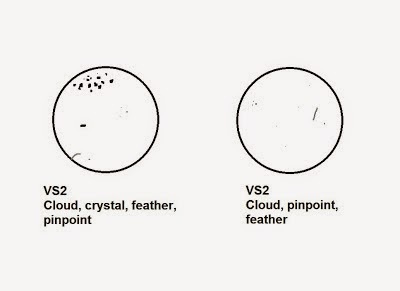 Later i realized the importance that diamonds both in the same set of VS2 range, can look entirely different, one being much better than the other(which makes a much better buy). Why does this exist? If you set through one of our appointments you'd know this already. "HEY. WHY ARE THESE 2 DIAMONDS LOOKING SO DIFFERENT?" - i'm writing this in caps because i was very loud when I was young. He used to tell me "it's the make of the diamond.... the make"
I didn't really understand that. Diamond dealers used to pop by my father's desk and say " this diamond, wonderful make, wonderful material"
I later learnt that make referred to the proportion of the diamond, material meant where the rough was from. 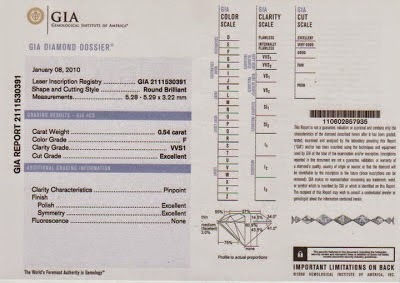 I started picking out diamond which had as close "Specs" on a certificate as possible. One always tend to look more brilliant than the other. Though on the tags they had the same price. General mentality of a kid would be "that ain't fair!" or rather "THAT AIN'T FAIR!" 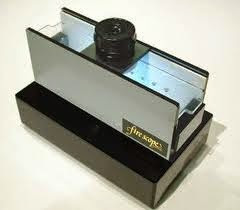 Back then, what was used to measure the Light Return of the diamond was called the firescope. It's still available today, but just less popular than the Ideal Scope or Aset Scope. I learned abit from a few dealers here and there, about the light return of a diamond. 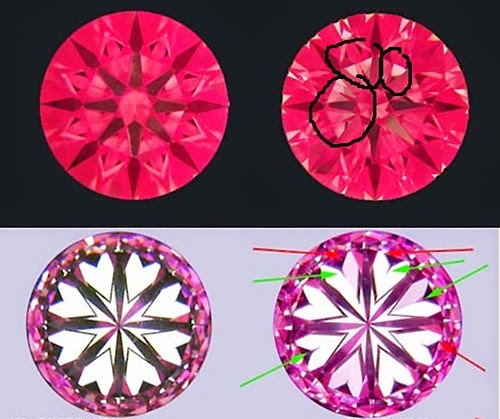 You learn this in GIA too, but not in that much detail, there isn't tools either to measure light return in GIA since they are all proportion based grading. So there is much more to it that just the certificate of a diamond. More things to understand than the simple 4 C's that any jeweler or sales assistant can tell you about. Which brings this question; Why? Poor, Fair, good, very good, excellent, extremely excellent, almost perfect, super ideal? This would cause a real big problem in the market, excellent diamonds would not sell for the good profits that people are currently making, very good cuts will fall out of even consideration, and super ideals would have prices sky rocket so high because of it's rarity and difficulty in cutting them. So the industry leaves it as it is. What works for them, works. As long as profits are good for them, they don't want to change a thing. AGS tries to help in this area and came out with the platinum light report. Even so, the Ideal cut grade has a large quality variation, not as much as GIA's excellent though. The first time I got my Ideal Scope, I started looking through all the diamond in my father's old inventory. From what i've learned, white = leakage. And man, was there alot of leakage. 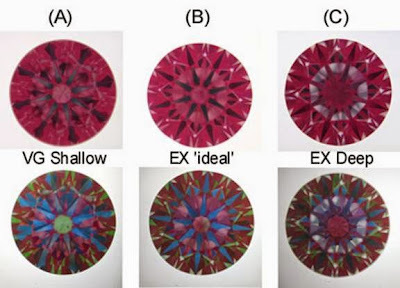 Many years ago, diamonds were not exactly polished or cut for maximum light return. There was so little education on this that Cutters maximized weight and focused on other aspects like increasing the clarity. BAM! Honestly, what on earth is that. Can you believe back in the day, they used to call this Hearts and arrows? 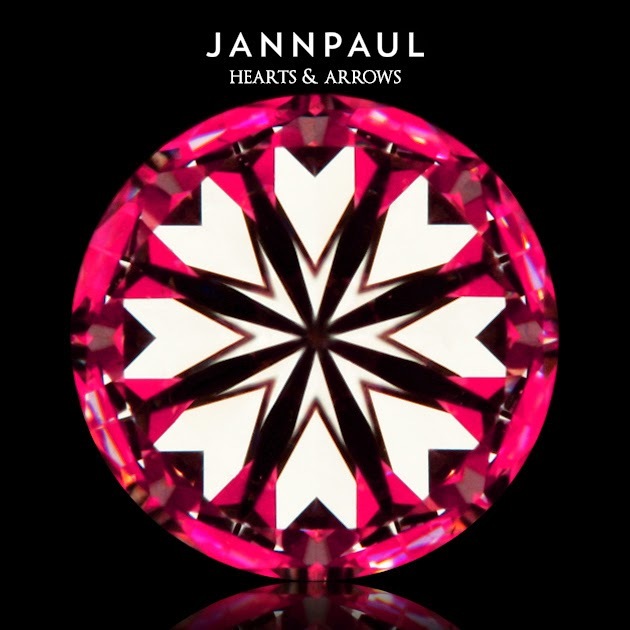 In fact, you still find many jewelers and diamond dealers calling this hearts and arrows. The question pops in mind, can a diamond, have great light return, superb hearts and arrows symmetry, and simply, be the best 57 facet diamond possible? The fact that 2 diamonds of the same "spec" certification can look so different, must mean that there's endless of reasons how a cut can affect a diamond's appearance. 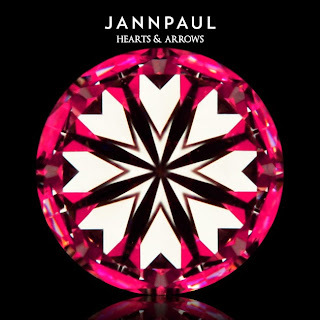 I used to jump from shop to shop, locally and internationally, to see if such diamonds exist, to my dismay most "hearts and arrows" diamonds were more or less like the above. A little better, or much worse. We started this blog to let our followers keep track and understand a little what goes behind the scenes at JP. 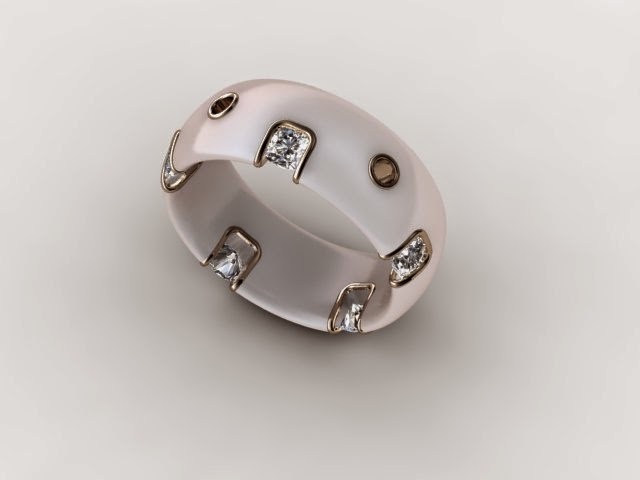 As agreed with my team, we decided that I will be covering designs that i'm currently working on so readers can grab some ideas here and there for their up coming rings! Basically, i run the custom design section in JP. If you have sat through an appointment with us and did a custom design, you have probably met me! Thank you for that honor, and it was a great pleasure. 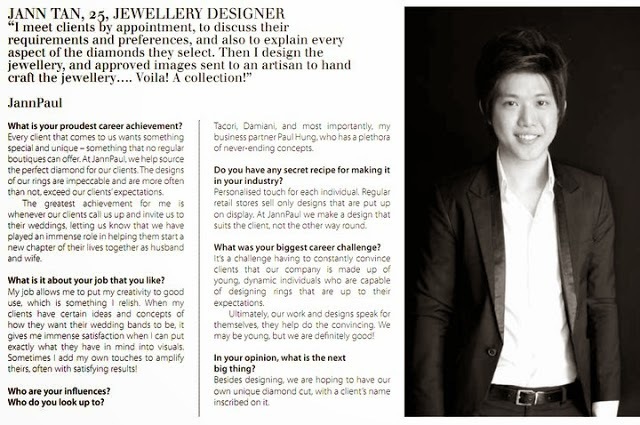 In my blog you will be able to see how I plan designs for clients, the problems we face how we tackle it and interesting ideas that you never knew could be done on a ring. Most of the designs that we do are decided between the client and our team. More heads eventually result in a greater end result! Diamond Buying: ASET or HCA? If you have a look at this video above, you can clearly see what the "REDS" "GREENS" & "BLUES" signify in a diamond. "I found a diamond online with a HCA of 0.6!" Because scopes are not easy to analyze for beginner buyers, most people only remember the range numbers of the HCA score, which is great for a start! However, purchasing a real solid diamond requires you to look at both of them. To someone new, diamond A and diamond B would look good to them. 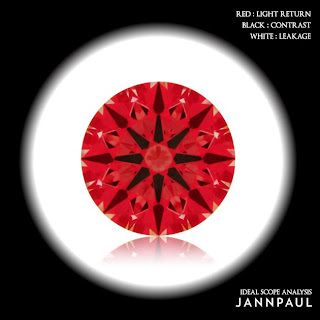 Reason being they only recognize light leakage which is found in diamond C.
Diamond A however, is a shallow cut which is over contrasted despite all the plentiful "reds". This is where the HCA comes in handy because they penalize shallow and deep cut diamonds. 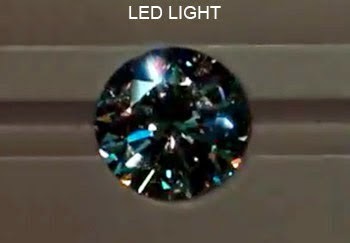 We would not know the actual light performance of the diamond. Many things could go wrong, such as poorly cut girdles, broken arrows, uneven areas of light leakage. Etc. Etc. 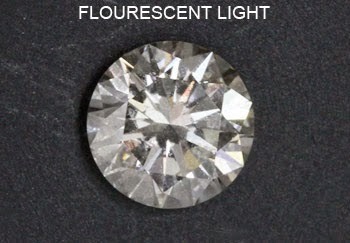 The best way in choosing a diamond is using the HCA only as a filter tool. 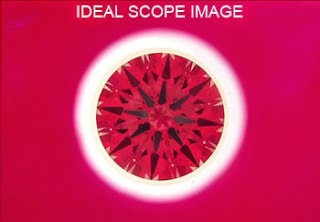 Pick out those in the ideal range, and after, analyze them with a ASET scope and H&A scope. 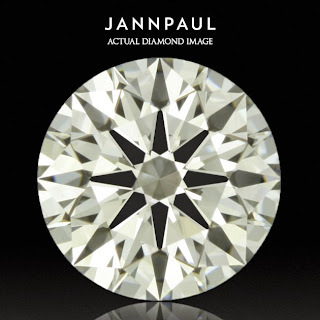 Happy Diamond Hunting, and remember: What you pay for in a diamond is every facet and every carbon. Make sure that diamond is perfect, make sure every cent is worth it. And make sure that diamond is cut to the highest possible standard. 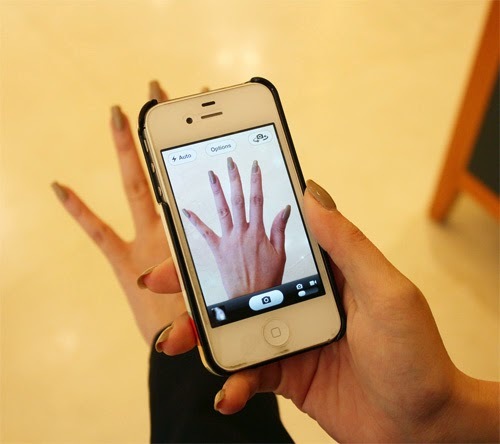 What is the average diamond size people purchase as proposal rings in Singapore? What size should i get as a proposal ring? What should my budget be? The common saying of "3x your salary". I don't believe in that, i believe you should get what you feel would look good on her or try to do some research and ask her friends or drop hints to figure out what she wants! 4 C's! What should my priority be? Color and clarity is interchangeable. But definitely priority Cut. Cut benifits not only it's overall brilliance but the other C's as well. It helps a diamond appear whiter face up, mask up inclusions and avoid deep cut diamonds that makes it look much smaller than it's actual carat size. Imagine 1 C benefiting 3 C's! What design should I look for? I'm Clueless! Will she be wearing it as a daily wear or occasional? Daily Wear - Requires you to get a more durable setting, less fancy and strong on the prongs. As she will be constantly on the go with the ring, try to go for a simple classic setting that is lasting through wear and tear. Occasional - You have much more room to play with. 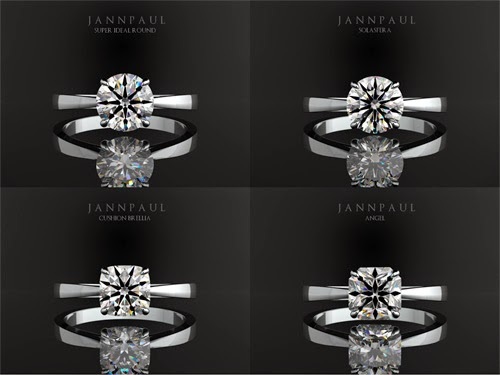 This is now entirely up to you whether you want to pave the ring with small diamonds or create a custom special design. Super Ideal or Solasfera? I'm stuck! Get both! Haha. It really depends on you. 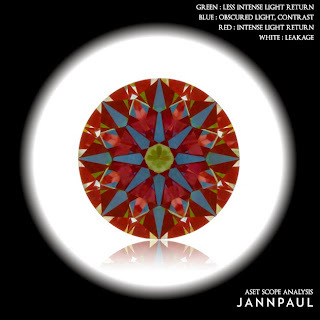 JP Super Ideal Round: The most balanced hearts and arrows diamond, this is the safest and most classic choice that performs extremely well under any lighting environment. The only drawback you may ever consider is when purchasing a really small Solasfera like 0.3 it may look over contrasted. Then again, it looks even more scintillating when the diamond is so small. Why do you like the Brellia so much? Years back, people said it was impossible to cut a square or cushion shape diamond to achieve the same optical performance as the round hearts and arrows. The first time i saw this diamond, a 0.6 little cushion, i immediately fell in love with it. You just won't find any other diamond that looks this special. What do you think about luxury brands like Tiffany / Cartier etc? I think some of their stuff is really great! I really do hope that bigger brands emphasize more on their cut quality though. It's very possible to buy a diamond ring from a private jeweller at 1/3 the price and when you place the 2 rings together the diamond ring from the private jeweller look way better. It's hard to put a "price" on branded jewelry, it's not like branded handbags where their designs and logo's allow you to recognize it immediately. However, some of the patented designs are really cool! 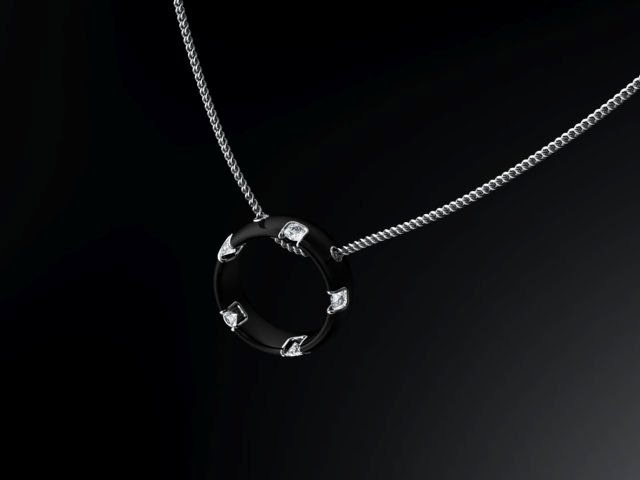 What do you think about local chain store diamonds? Most of the local branded diamonds are actually re-branded diamonds. E.g: brilliant rose is aka the Leo Cut. I would say some of them are pretty alright, but some are priced so high that I honestly feel the international brands are more worth it. Can't really comment more haha. How frequent should I return to do a prong check? On the safe side, I would check every 7-12 months. 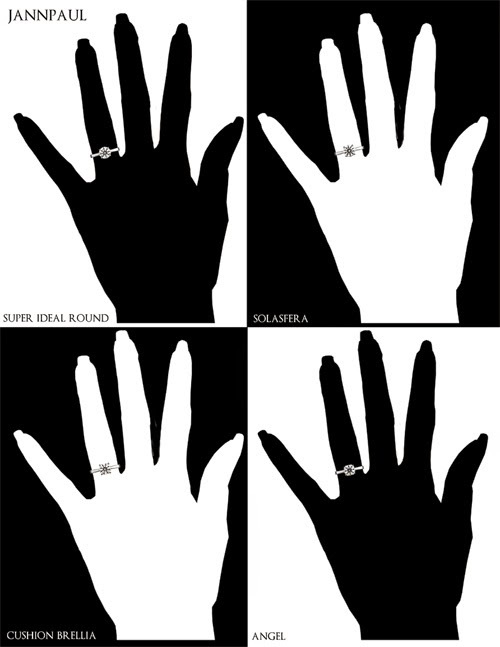 Depending on how frequent the user is wearing the ring. It's always better to be safe than sorry! Last thing you want happening is to lose that diamond. We offer free prong checks and cleaning while we are at it. Feel free to drop by anything, we are more than willing to help! I've worn my diamond for a month, and it looks duller and duller, what is happening? Dirt and dust gets trapped/stuck easily onto your diamond and the prongs. 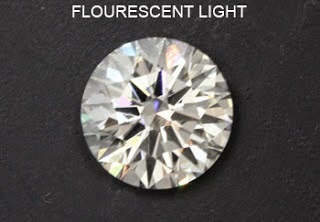 This makes your diamond appear lack luster because the dirt is blocking light in and out. A good wash will return it back to the first time you got it! What advice do you have for a diamond rookie or someone who is new to this and wants to get a ring to propose? Research as much as possible. 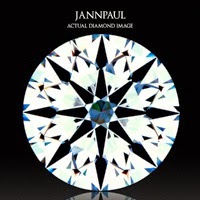 Read up online what makes a great diamond! Remember, you're spending each hard earned cent on every facet of that diamond, and i'm pretty sure you want it to look great on your partner's finger. Don't be fooled by strong halogen lights in various shops, always use diamond tools such as scopes to view the diamond first. The thing is, even after so many years in this industry, I can't purchase a diamond just by looking at it. I still require scopes and loupes, so you should too! When i first started, i made some stupid purchases, diamonds with crooked arrows, unsymmetrical hearts, minor light leakages. While for the same price, i could get something perfect if I took the time to research more. The diamond purchasing process is actually a really fun one, you will remember this process for the rest of your life! 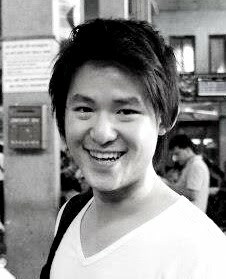 Brief introduction about myself and what to expect. Hi, Im Samuel III a.k.a. “SAM” from JANNPAUL, this is my blog, I am a Filipino (and Im proud to be one), I am so blessed and thankful to be part of the team. 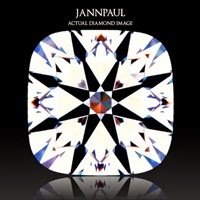 Basically I'm a personal assistant of JANNPAUL, my duties are: to assist JANNPAUL Customer with love and care; monitor and update JANNPAUL Blogs, Facebook Page ( the iframe landpage); and the JP Website (which will be up soon) and share my ideas that is helpful to the company. What you can expect to my blogs? Anyway I'm going to share all my knowledge about diamond ring that can be helpful for those who are seeking for best quality diamonds for their love ones. Thank you very much for reading my short introduction. God Bless Us All!